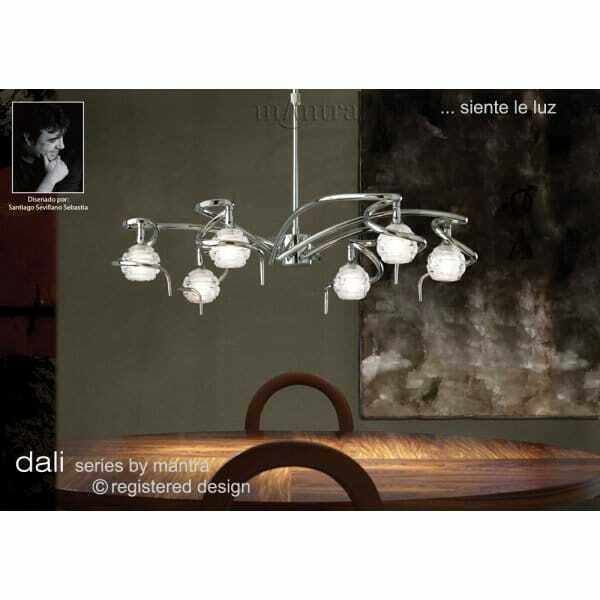 Dali 6 light ceiling pendant light in polished chrome and sculptured glass. A lovely modern ceiling light, which is designed and manufactured by Mantra Lighting, and would work well over a dining table or anywhere a feature light is needed. The light is attached to the ceiling on a circular polished chrome rose and suspended on a telescopic rod suspension. The height can be adjusted when fitting to cater for higher or lower ceiling drops. The 6 halogen lights are carried on curved polished chrome arms that radiate from the centre in a circular pattern. The halogen capsule bulbs are hidden inside the round, sculptured, clear and frosted, Spanish glass shades.